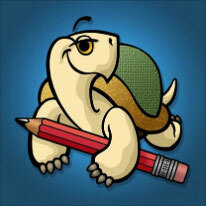 'Turtle Graphics' is an ios app made by Mertz Werkz for the Apple ipad. Download and install the app from the iTunes store. 'Turtle Graphics' requires no keyboard typing of commands. Instead, it relies on a roadway layout to control the program flow. Loops and conditional jumps can be made. This delivers an easy to use interface of drag and drop which is ideal for the touch screen ipad. Logo is an ideal educational language for youngters to learn about computer programming. There is a wealth of material on the web. A good place to learn more is the Logo Foundation site. And of course my own xLogo pages on this site. On these pages, I've used 'Turtle Graphics' to create a few classic Logo designs. Each is built using a single road map. Use the links above to see recursive C_Curve and Tree designs.